Situated in Ballito, KwaZulu-Natal’s premier coastal holiday town, Lifestyle Centre provides upmarket shopping to affluent residents and holidaymakers. Evolution Architect's principal, Raewyn Hayhoe, was the project architect for the original Ballito Lifestyle Centre in 2001. In 2005 Brent Becker joined her on the project and the centre remains an active client today. 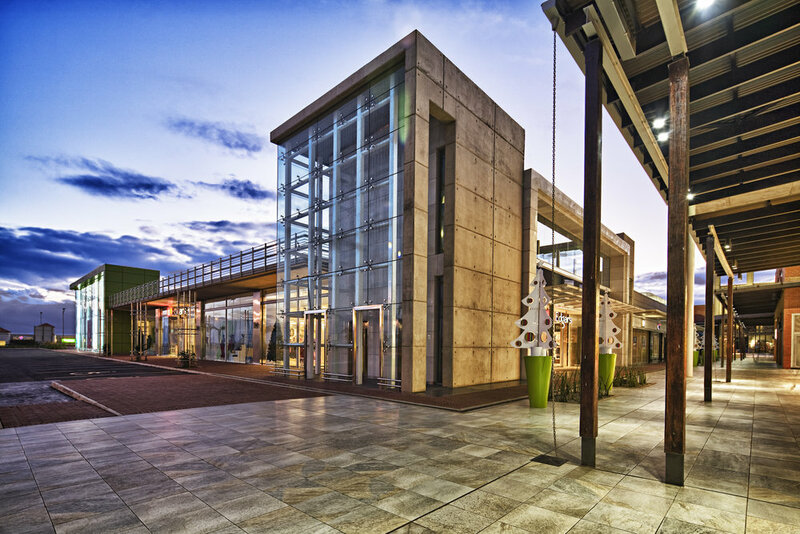 The first extension to Ballito Lifestyle Centre transformed the former strip centre into an attractive lifestyle destination. It extends and complements the existing centre with an exciting sequence of environments and tenant mix changes. The up-scaled space has attractive restaurants and picturesque landscapes in an open street environment. The second extension provided an additional 4 000m² of retail area for an Edgars concept store and eight exclusive line shops housing boutiques, a restaurant and strong national fashion brands. The concept was to create a new retail 'box' with meticulously considered position, proportions, detailing and architectural design elements. The design style is contemporary, achieved using high-tech construction materials, finishes and techniques and innovative engineering and architectural features. The clean lines of the detailing are simple, elegant and refined. Consideration was given to all aspects of aesthetics, functionality and ultimately the customer experience. Ballito Lifestyle Centre has yet again evolved with an exciting new redevelopment including a food market offering locally created and organic food, upmarket restaurants and exclusive boutiques which have proved to be popular amongst the local community. The centre has also allowed for the new anchor tenants. This has brought something new and exciting to Ballito, which had generated a positive response to the project. With a focus on providing customers value for money, and increasing the skills and employment level in smaller communities, Aheer's Cash and Carry has grown into a very successful enterprise. They have multiple Cash and Carrys, all with a great reputation of being clean and efficiently run in all departments. The enterprise approached Evolution Architects to address a need in the community of Kranskop. With careful consideration of the budget and weather conditions, we were able to build a suitable delivery and storage area below the trading area, allowing all trade to happen at one level. The high floor to ceiling volume and pitch of the roof was built for snowfall during winter. Customer experience was key in the construction, and meticulous attention was paid to signage as this allows for a seamless shopping experience and easy access around the store. This major refurbishment and revival of an existing shopping centre in Glenashley, Durban has been well received by its community. The centre has high visibility from the M4 roadway so it was important that the architecture be eye catching and striking. The refined industrial aesthetic of clean lines and simple, yet elegant detailing contributes to the success of this retail development. With the use of large glazed areas in a steel framework, a highly visual and open aesthetic is created with prominent display areas towards the conveniently located parking area.